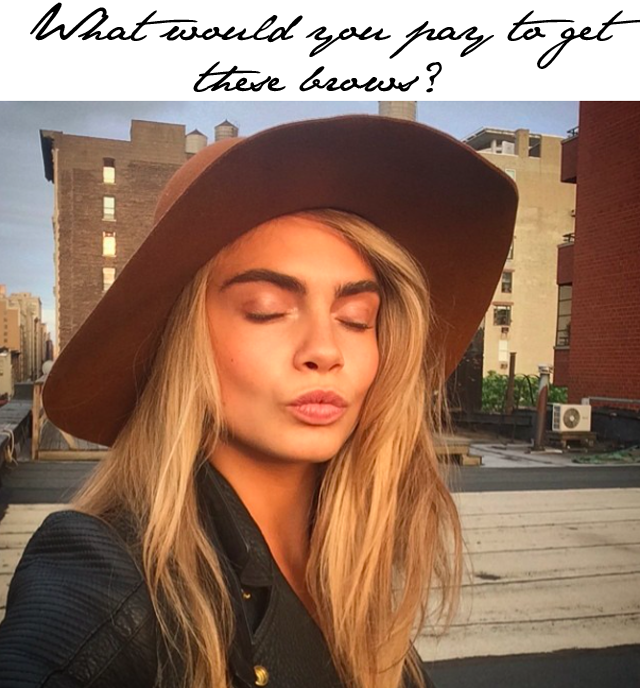 Would you pay $10,000 to have brows like Cara Delevingne? It's all about big brows these days. In fact, it has been for a while now. I blame the likes of Cara Delevingne, Kiera Knightley, Jennifer Connelly, Camilla Belle and the mother of all big brows - Brooke Shields. Now, if you're of a certain age, this new trend will annoy the living daylights out of you. I'm speaking specifically to those of you that lived your teenage years and beyond during the 1990's - the era of the skinny brow. From Cosmopolitan to 90210, the mass media were telling us that it was all about the skinny brow. We were made to pluck and tweeze some more until there was nothing left but a clean and heavily arched line above our eyes. Some even went as far as to shave off their brow completely and replace the hair with a pencil line, yes, drawn in with an actual pencil. Gasp! Shock Horror! In 2014, skinny brows find themselves starring down the barrel of a heavy brow love affair. And anyone that plucked to stay on trend is up a creek without a paddle, or so many of us were led to believe. There are actually new ways to bush up the brow. Technological advances have provided us with all sorts of options. In fact, today in the New York Times, there's a whole article on the options presented for those who are follicle challenged in the brow area. Perhaps the most shocking answer to the skinny brow dilemma is one that will set you back up to $10,000 and involves a lot of pain and suffering, and minor surgery. This is known as a brow transplant. Hair is grafted from the back of the neck or the scalp and is inserted into the areas of the brow that need filling. If you're lucky enough to escape without too much bruising, you may be public-appearance ready in a week. Oh joy. For those of you looking for less invasive procedures, there are special gels, vitamins, semi-permanent tattoos and more available for assisting in a fuller brow. Or you could just go the ole pencil route and pray for clear skies. Oh the dilemmas in life we are presented with, eh? Note: I'm currently trying out Revitalash on the brows. Will let you know how it goes after a month!